The historic volatility combined with the limited availability of traditional retirement income sources, such as defined benefit pension plans, has placed a greater responsibility on Americans saving for their future. With this greater responsibility comes a need for financial solutions that can help provide a new level of protection for retirement savings. Whether your long-term objective is to build a source of guaranteed lifetime income, save for a specific retirement goal, or leave a legacy for your loved ones, Clear Diamond Life can help by offering annuities with benefits designed to meet your retirement needs. ​Fixed index annuities provide an opportunity for potential interest growth based on changes in one or more indexes. Because of this potential indexed interest, FIAs provide a unique opportunity for accumulation. And since the interest your contract earns is tax-deferred, it may accumulate assets faster. 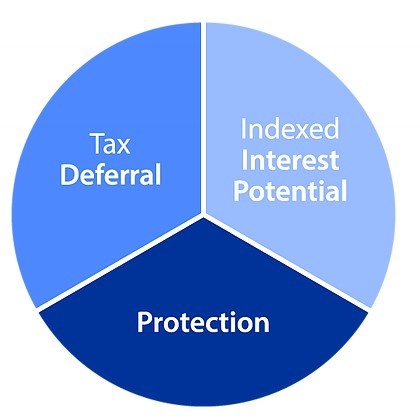 In addition to potential indexed interest, FIAs can offer you an option to receive fixed interest. ​(1) Accumulation: Your principal and credited interest are protected against market downturns. ​​(2) Guaranteed income: You can be protected from the possibility of outliving your assets. ​(3) Death benefit: If you pass away before annuity payments begin, a fixed index annuity may help you provide for your loved ones.